You may find it helpful to measure out the area and mark out sections 1m2 x 1m2, to help you distribute Sand Remedy accurately. Sprinkle the required amount of Sand Remedy onto the soil. Using a shovel, garden fork, hoe or mattock, lighly turn or mix it to a depth of approx. 10cms until it is incorporated into the soil. Water in well. You will see Sand Remedy beginning to work straight away. If you feel a repeat application is necessary, simply repeat the process. Click here to see a short tutorial video on using Sand Remedy in a new garden bed. Using Sand Remedy in an existing garden bed. If you are using Sand Remedy in an existing garden, gently remove mulch to one side. Sprinkle Sand Remedy over the top of the soil, and using a small trowel, shovel or fork, lightly turn it through the top 10cms of soil in light movements. Take care not to disturb plants, or to chop through roots you may dig up. The idea is to work the Sand Remedy into this top 10ms of soil as much as practicable. Once you have incorporated the minerals into the soil, water in thoroughly. You will see Sand Remedy beginning to work straight away. If you feel a repeat application is necessary, simply repeat the process. Once the soil is well soaked, replace the mulch on top to help keep the moisture in the soil. Click here to see a short tutorial video on using Sand Remedy in existing garden beds. Using Sand Remedy on lawns. It is a great idea to incorporate Sand Remedy into the soil before laying new turf. (Follow instructions for using Sand Remedy in a new garden bed.) If your existing lawn has water repellent patches, Sand Remedy can still be helpful, but you do need to get the minerals into the soil to be effective. The best way to do this is with a special aeration tool, or with a garden fork, making small holes in the surface. Sprinkle Sand Remedy over the top, then water in well. Repeat applications may be required in highly compacted areas. Click here to see a short tutorial video on using Sand Remedy on lawns. Using Sand Remedy in planting holes. To prepare a planting hole, dig out an area at least twice as big as the pot the plant is currently in. Use about half the soil you remove, and add in a soil improver in equal amounts. Add in a small handful of Sand Remedy and mix together. As a general rule, allow approximately 5 - 10% (maximum) of Sand Remedy as the total volume of soil used to plant, so the bigger the plant, the more Sand Remedy you will need. Put some of the soil mix into the hole, water well, then pop in your plant and use the rest of the mix to fill all around the planting hole. Press in and backfill, and water in thoroughly. Click here to see a short tutorial video on using Sand Remedy in a planting hole. Areas of your garden will most likely be different in how they absorb water. This is natural, so vary the application rate as you feel necessary. If you accidentally add too much Sand Remedy, simply dig it in a little further. 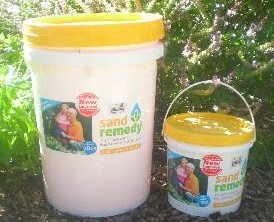 Sand Remedy is made up from a range of crushed mineral material. While it is is non-toxic, inhalation of any fine dust over a prolonged period without using respiratory protection may cause lung disease (eg. silicosis). When using any mineral product, avoid using in windy conditions, and wear a dust mask when applying to protect from inhalation.